The Google Operating System Is Real: Google Chrome OS Announced. Ars Technica posted earlier that Google is to unveil its long rumored computer operating system, and now Google confirms this is true in a blog post: Introducing the Google Chrome OS. The company says that the OS will be released later this year (likely in the fall, I’m told) to developers, designed primarily for netbooks but not limited to them. Then in 2010, it expects it will be available to consumers (though no doubt, many enthusiasts will try it on their own machines). From the company’s post: Google Chrome OS is an open source, lightweight operating system that will initially be targeted at netbooks. Later this year we will open-source its code, and netbooks running Google Chrome OS will be available for consumers in the second half of 2010. Because we’re already talking to partners about the project, and we’ll soon be working with the open source community, we wanted to share our vision now so everyone understands what we are trying to achieve. 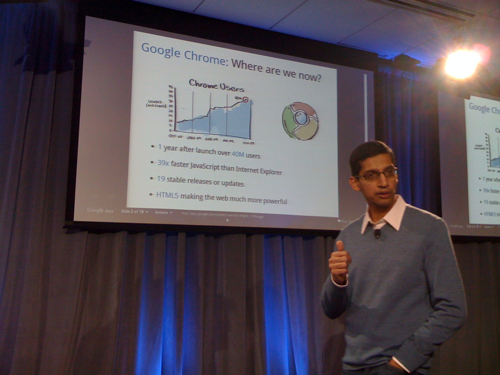 Speed, … [Read more...] about The Google Operating System Is Real: Google Chrome OS Announced.